BASKETBALL legend Dennis Rodman has had a bizarre meeting with North Korea’s Kim Jong Un reportedly telling the despot: “You have a friend for life”. The Communist state leader met the US star – who says he is on a peace mission – before plying an American TV crew with drink leaving them “wasted”. The meeting came after the reclusive state allowed the former Celebrity Big Brother star and three members of the Harlem Globetrotters to visit the country. 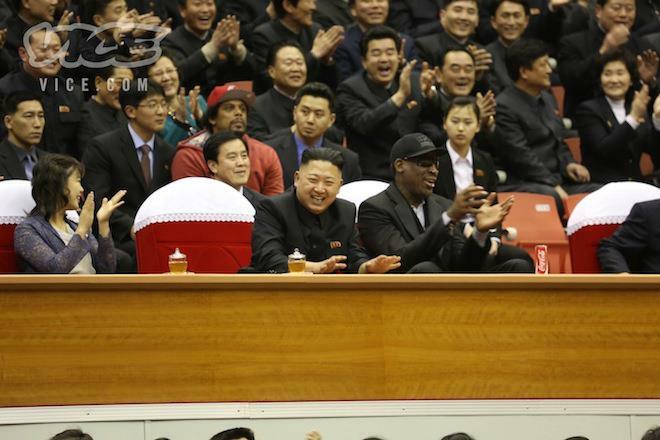 Rodman and Kim sat side by side at an exhibition game in Pyongyang, chatting as they watched players from North Korea and the US played on mixed teams. Alex Detrick, a spokesman for the New York-based VICE TV who are covering the visit, said Rodman addressed Kim in a speech before a crowd of tens of thousands of North Koreans, telling him: “You have a friend for life”.